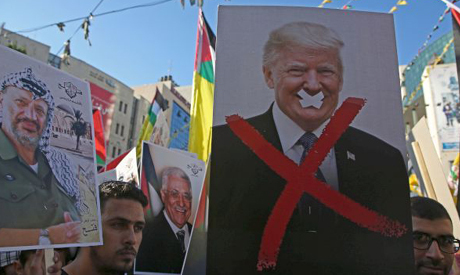 (FILES) In this file photo taken on July 17, 2018 Palestinian protestors hold portraits of late Palestinian leader Yasser Arafat and US President Donald Trump during a rally in support to the Fatah movement in the West Bank city of Nablus. The United States said Friday that it had canceled more than $200 million in aid for the Palestinians in the Gaza Strip and West Bank, leading their ambassador to accuse President Donald Trump's administration of being "anti-peace." A senior State Department official said the decision, made "at the direction of the president," came after a review of aid programs to the Palestinian territories. The funding previously allocated for programs in the West Bank and Gaza will "now address high-priority projects elsewhere," said the official. The move "takes into account the challenges the international community faces in providing assistance in Gaza, where Hamas control endangers the lives of Gaza's citizens and degrades an already dire humanitarian and economic situation," he said. Relations between the US administration and the Palestinian Authority took a nosedive after Trump announced the US decision to recognize Jerusalem as Israel's capital. The Palestinians have suspended contacts with the administration and consider that it can no longer play a mediation role in the Middle East peace process. "This administration is dismantling decades of US vision and engagement in Palestine," Husam Zomlot, head of the Palestinian General Delegation to the United States said in a statement. "After Jerusalem and UNRWA, this is another confirmation of abandoning the two-state solution and fully embracing (Israeli Prime Minster Benjamin) Netanyahu's anti-peace agenda." The decision to cut Palestinian funding comes amid a humanitarian crisis in Gaza, which has seen a surge of violence since Palestinian protests began in March. At least 171 Palestinians have been killed by Israeli fire during demonstrations near the border with Israel. The US administration is pressing on with work on a peace plan that has been under discussion for months, leaving a vacuum in the Middle East in the meantime. "Weaponizing humanitarian and developmental aid as political blackmail does not work," Zomlot said. "Only a recommitment from this administration to the long-held US policy of achieving peace through the two-state solution on the 1967 borders with East Jerusalem, the capital of the state of Palestine, and respecting international resolutions and law will provide a way forward." Democratic Senator Patrick Leahy accused the White House of engaging in a "series of provocative and harmful acts" instead of coming up with a coherent policy to address the Israeli-Palestinian conflict. Trump has tasked his son-in-law Jared Kushner and lawyer Jason Greenblatt to draft the peace proposals, saying earlier this week that there would be something "very good" for the Palestinians. The Palestinians see the eastern part of the disputed city as the capital of their future state.